Another amazing award winning flavoured cheese from the Snowdonia Cheese Company, Pickle Power Cheese is made from exactly what it says on the wax. A strong and powerful mature Cheddar cheese with big chunks of pickled onion infused throughout giving it a tangy kick! 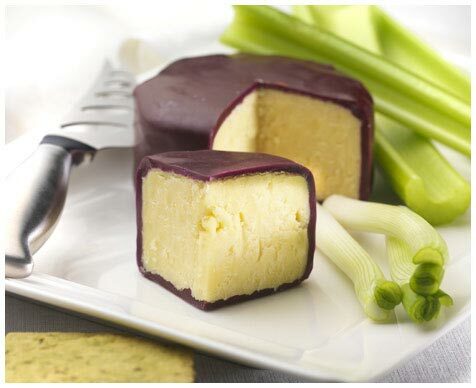 Pickle Power cheese is a 2005 Bronze Nantwich award winning hard cheese wrapped in a burgundy wax. Pasteurised and suitable for vegetarians, there’s no reason to delay the tangy taste test. Unlike some flavoured cheeses, you really can tell that this mature Cheddar has an intimate relationship with the embedded pickled onions, so this is a powerful, full flavoured, tangy cheese. Pickle Power does the work for you really, so this cheese works great on it’s own to make a cheese and onion sandwich in thick, crusty farmhouse bread, or as part of a ploughman’s lunch with a real ale. It also holds it’s own with wheat or rye wafers, maybe with a dollop of home-made pickle and a nice glass of Port.